After a recent launch of Blade Max 3, ZTE has unveiled yet another smartphone device- the Max XL for the US markets. Priced at $129 (approx. Rs. 8,200) the novel device features a large screen with a 6-inch full-HD (1080 x 1920 pixels) LCD display and Gorilla Glass protection. Powered by 1.4 GHz octa-core Snapdragon 435 SoC it comes with 2 GB of RAM. On offer also is 16 GB of inbuilt storage, further expandable via a microSD card slot (up to 128 GB). Running on the latest Android 7.1.1 Nougat MAX XL sports a fingerprint scanner at the back, while the power and volume buttons are housed on the right edge of the smartphone. On the optics front, the smartphone boasts of a 13-megapixel rear facing camera with flash, and a 5-megapixel front snapper for selfies and video chats. It is fired up by a 3,990 mAh battery slated to deliver up to 26.6 hours of talk time. Connectivity options include 4G LTE, USB Type-C port, Bluetooth v4.2, Wi-Fi, and a 3.5 mm audio jack. 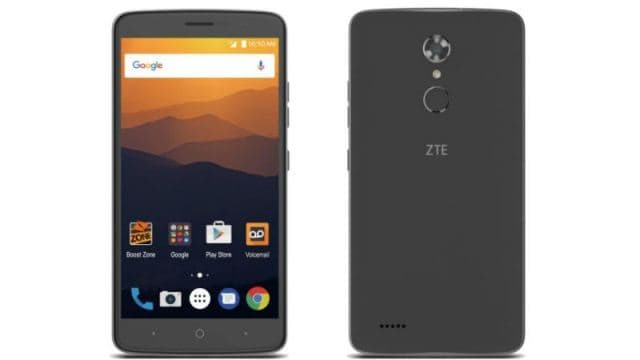 ZTE MAX XL would be available for sale on Boost Mobiles for $101.00 with $28 as promotional discount. There is no official announcement yet regarding its launch in India.